v. : ill. ; 26 cm. Division of Cooperative Forest Protection, Forest Service, U.S. Dept. of Agriculture. 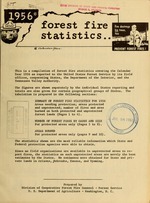 Prepared by the following divisions of the Forest Service: Division of State Cooperation, 1938-1944; Division of State Cooperative Fire Control, 1945; Division of Cooperative Forest Protection, 1946-1955; Division of Cooperative Forest Fire Control, 1956-1967. Description based on: 1955; title from cover. forest lands (Pages 1 to 4). For protected areas only (Pages 5 to 8). For protected areas only (pages 9 and 10). Federal protection agencies were able to obtain. vate lands in Arizona, )Iebraska, Kansas, and Wyoming. U. S. Department of Agriculture Washington, D. C.
/ Includes 15,391 M acre State and privately-owned nonforest critical wtershed areas. TOTAL 1.781 1,267 514 71.14 4 4 100.00 6 6 100.00 neg. TOTAL 4 4 4 .
on west side of Divide. Worst fire weather on record. Severe dry lightning storms. Late season drought in south Utah. Lack of summer moisture in Nevada. Fire weather generally favorable. Dry March winds in Central States. October drought in parts of Lake States. :: -.. 4 ... .. .. .